Mount Sinai School of Medicine researchers have succeeded in developing a biosynthetic polyphenol that improves cognitive function in mice with Alzheimer's disease (AD). The findings, published in a recent issue of the Journal of Neuroscience, provide insight in determining the feasibility of biosynthetic polyphenols as a possible therapy for AD in humans, a progressive neurodegenerative disease for which there is currently no cure. Polyphenols, which occur naturally in grapes, fruits, and vegetables, have been shown to prevent the cognitive decline associated with AD in a mouse model, but the molecules are very complex and are extensively metabolized in the body. This is the first study to determine which specific subfraction of these molecules penetrates the animal brain, and demonstrate that a drug compound similar to polyphenols can exert similar bioactivities. A research group led by Giulio Maria Pasinetti, MD, PhD, Saunders Family Professor and Chair in Neurology at Mount Sinai School of Medicine, has been exploring the application of specific grape-derived polyphenols for the treatment of AD. Previously, this group found that certain grape-seeds extracts, comprised of a complex mixture of naturally occurring polyphenols, were capable of lessening cognitive deterioration and reducing brain neuropathology in an animal model of AD, but they did not know how to manipulate the natural extract into a pharmaceutical compound that could be used by the brain. "My team, along with many members of the scientific community, did not know how we could harness the efficacy of naturally occurring polyphenols in food for treatment of Alzheimer's disease," Dr. Pasinetti said. "We were skeptical that these naturally occurring polyphenols would reach the brain because they are extensively metabolized following ingestion." 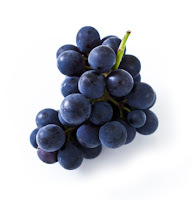 The researchers separated the natural occurring polyphenols from grapes, sorted them by size, and administered each for five months through drinking water to mice genetically altered to develop AD, after which they assessed brain neuropathology and cognitive function of the mice. They identified a specific grape polyphenol metabolite that was capable of selectively reaching and accumulating in the brain. This compound reduced the neuropathology of AD in the brain by preventing the accumulation of abnormal proteins in the brain, a hallmark of AD. Dr. Pasinetti's team analyzed the structure of this polyphenol by nuclear magnetic resonance imaging and recreated it biosynthetically in the laboratory. Dr. Pasinetti and his collaborators discovered that the synthetic polyphenol generated in the laboratory also promoted plasticity and benefits in learning and memory functions in the brains of the mice. "While this is an exciting development, we have a lot to discover and many years of testing before this agent can be considered in humans," said Dr. Pasinetti. "I look forward to further studying this compound to determine its feasibility as a treatment for Alzheimer's disease." Dr. Pasinetti is currently exploring the possibility of delivering biosynthetic polyphenols nasally or subcutaneously, thereby preventing them from being metabolized in the liver. Mount Sinai researchers are supported by a grant from the National Institutes of Health. Dr. Giulio Maria Pasinetti is a named inventor of a pending patent application filed by Mount Sinai School of Medicine (MSSM) related to the study of Alzheimer's disease. In the event the pending or issued patent is licensed, Dr. Pasinetti would be entitled to a share of any proceeds MSSM receives from the licensee. The Mount Sinai Medical Center encompasses both The Mount Sinai Hospital and Mount Sinai School of Medicine. The Mount Sinai Hospital, founded in 1852, is a 1,171-bed tertiary- and quaternary-care teaching facility and one of the nation's oldest, largest and most-respected voluntary hospitals.